There is no doubt that if Schubert had not returned to this text in 1826 and composed a definitive Heiss mich nicht reden, this earlier version of Mignon’s plaint would now be much better known. The famous setting in E minor which forms part of the composer’s Op 62—the four settings from Wilhelm Meister published in March 1827—has dominated the recital platform to the exclusion of the song recorded here. This is an example of an uncontested masterpiece being the enemy of something only slightly less remarkable, and we find such an embarras de richesse more than once in Schubert’s work-list. 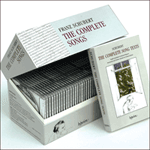 The more familiar version (printed in Volume II of the Peters Edition and thus easily accessible to generations of singers) can be heard on Volume 26 of the Hyperion Edition where there is an extended commentary about the genesis of the Wilhelm Meister songs. Schubert chooses the key of B minor for this version, thus giving the same tonality to his two great female creations of 1821, Suleika and Mignon, Goethe characters both. The first version of So lasst mich scheinen (composed at the same time, in April 1821) is also in B minor, and the songs seem something of a matching pair, particularly when it comes to the similarity of their chromatically-inflected postludes. (Schubert also reserves B minor for Mignon und der Harfner, the duet from Op 62, and B major for the final version of So lasst mich scheinen, Mignon’s third song.) 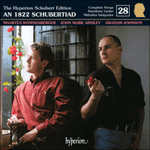 As John Reed writes: ‘B minor and B major stand at the ambivalent centre of Schubert’s emotional world. Together they represent what may be called the passion (in every sense of that word) inherent in the human condition.’ The fragility of the waif’s existence (she will die at the end of the novel) is reflected in the use of the dactylic rhythm (long, short, short, or minim, crotchet, crotchet) which the composer had employed to immortal effect in Der Tod und das Mädchen in 1817. Presumably this is because Schubert interprets Mignon’s fate—the ‘Schicksal’ of which she speaks—as implacable, like death itself. Characteristic Schubertian pathos is shown in the alternations between B major and B minor to underline the difference between the ideas of longing and fate in a type of counterpoint: for the first line of the strophe the key is B minor, and it changes to B major for the second. The third and fourth lines alternate similarly; and the same pattern, one line of minor, and one of major, governs the third strophe of the song. The major-key sections seem even sadder, perhaps because more childishly vulnerable, than those in the minor. The second verse is the contrasting middle section of the poem. At ‘sie muss sich erhellen’ the elongation of the word for ‘illuminate’ or ‘brighten’ (a semibreve on ‘erhellen’) depicts the imposing radiance of daybreak with a majestic modulation into G major. A tiny detail, but a significant one, is the ornamentation of the vocal line, a tiny turn of semiquavers following a dotted crotchet, at ‘tiefverborgnen Quellen’. True to the meaning of the words (‘deep-hidden springs’), this motif is heard hidden deep in the piano part precisely a bar before its appearance in the voice; it is as if Mignon discovers the secret of the well-spring in the rock face, and has conjured the water to the surface. The third strophe is loosely modelled on the first, but this is not quite an ABA structure; the music takes on a dramatic and rhetorical turn at ‘Und nur ein Gott vermag sie aufzuschliessen’ which leads to the song’s conclusion. Throughout the song, the tessitura of the voice is poised high on the stave, and there is a significant distance between the vocal line and the piano where the right hand of the accompaniment is concentrated in the alto and tenor registers. This is prophetic of the layout of Nacht und Träume, perhaps Schubert’s most famous song in the key of B major, where there is a similar sense of the vast space between heaven and earth, as between the dreams of humanity and their realisation. As the world turns, and as night follows day, the destinies of human beings are governed by inscrutable laws beyond their control, and this background unites the two texts in the composer’s mind. When Schubert wrote Nacht und Träume a year or so later he used the same tonality, and the same layout, as for Heiss mich nicht reden, but it seems to me that he was neither consciously quoting the earlier song nor recycling old material. The similarities have come about because the composer has simply invoked the tone-to-word vocabulary at his disposal which is as second nature to him as making coherent sentences in German for everyday use. Because he perceived both the poems as somehow related in their meaning, his musical response to both poems was inevitably, and unselfconsciously, similar. In his Lieder, the composer speaks a compositional language of his own (developed partly through the music that he heard in his formative years, particularly Mozart and Beethoven) which is based on a highly complex and sophisticated collection of tonal analogues. This made word-setting, in the case of the divinely talented Schubert, partially an act of translation from one language (the poet’s) into another (his own). Everybody around him spoke the first, he alone spoke the second. It is this which gives such a remarkable consistency to his musical response to poetic imagery throughout his working career. The systematic study, and listing of this personalised library of Schubert’s musical responses and motifs in relation to his poets’ words, ideas and concepts, is one of the great tasks that now faces Lieder scholars. bestows on the earth its deep-hidden springs.